It seems like only yesterday that the 2017-2018 NBA season began full of all its hope and anticipation. This season has brought some tragic injuries, shocking trades, and unexpected outcomes as we head into the first-round of the playoffs. I’m looking forward to some of the first match-ups given that things have shaken up a bit this year, and there are some new rosters that I believe will make an impact on the outcome in each conference. In case you haven’t been tracking the standings, we have a brief preview of each first-round series along with predictions on what the outcome will be. Given the devastating injuries the Boston Celtics have sustained this year, combined with the overwhelming turnover for the Cleveland Cavaliers, the Toronto Raptors have crept their way into a comfortable lead in the Eastern Conference for the first time in the franchise’s history. The Raptors boast a top ten defense which isn’t necessarily a first-seed worthy scenario, but nonetheless, their defense has improved with the acquisition of Serge Ibaka to combine with Jonas Valanciunas under the rim. Ibaka and Valanciunas may help make up for some of the defensive challenges Toronto faces on the perimeter with their guards Kyle Lowry and DeMar DeRozan. However, Lowry and DeRozan have their work cut out for them as they’re facing another incredibly effective backcourt in John Wall and Bradley Beall. Wall and Beall average a combined 41 points, 14.1 assists, and 7.8 rebounds per game compared to Lowry and DeRozan who combine for 39.2 points, 12.1 assists, and 9.5 rebounds on average each game. Valanciunas has a slight statistical, and height advantage over Washington’s Marcin Gortat, but Gortat’s veteran experience in playoff situations may give him the leg up over Valanciunas under the rim. The difference maker may be in each team’s bench. Toronto has more depth at their disposal, and while Washington’s bench may be more experienced, Toronto’s available options for different lineups will give them the flexibility they need to respond strategically in different scenarios. The Minnesota Timberwolves edged out the Denver Nuggets for the 8th spot in the Western Conference last week, and they’ll head to face the Houston Rockets in round 1 of the playoffs. The Timberwolves acquired Jimmy Butler in the offseason, and in March they picked up Derrick Rose when he was released by the Utah Jazz, after being traded from the Cavaliers. Minnesota deserved to get their 8th seed position over the Nuggets, and their 4th ranked offensive standing in the NBA affords them the opportunity to take control of a game over a team who isn’t firing on defense. Rose proves himself able to score in tricky situations, but his overall effectiveness is a far cry from what it once was and he just won’t be able to compete against Paul and Harden duo on the court. Karl-Anthony Towns is a force to be reckoned with on the offensive glass, and his aggressiveness to score under the rim has caused him to become an elite player in the league. However, defensively the Timberwolves leave much more to be desired which is the primary cause for their lower ranking in the West. Against the scoring brilliance of James Harden at an average of 30.4 pointsÂ and 8.8 assists per game along with Chris Paul with 18.8 points and 7.9 assists per game, the T-wolves woes on defense will be put on full display. The Rockets’ firepower is just too powerful, and even though Jimmy Butler may prove more of a defensive presence against Harden than any of the Nuggets could have hoped to be, Harden simply plays too intelligent against defenders baiting them into silly fouls landing them on the bench in foul trouble, or too tentative to put forth their best effort on defense. The Celtics were dealt a hard blow when they lost Gordon Hayward five minutes into the first game of the year, and over the course of the season, injury has taken its toll on the team. Ranked #1 in defense all season long, it’s no wonder the Celtics players have some wear and tear to show after playing a grueling 82 games over the course of less than 6 months. Without Hayward, the Celtics were plugging along just fine with a very comfortable lead in the East, but injuries to Kyrie Irving, and then Marcus Smart (who is a wild-card, but crucial on defense) caused the Celtics to lose their grip slipping into second place. However, under the coaching genius of Brad Stevens, the Celtics have adopted a similar model to the San Antonio Spurs in that each player is trained as if they were the star of the team with the idea that anyone going down with an injury will be able to have a suitable replacement to keep the team’s rhythm flowing. The Celtics will be without Hayward, Irving, and Smart in this first round leaving them woefully vulnerable to the tougher teams in the East. Veteran Terry Rozier is ready to step up to attempt to fill Irving’s shoes, and defensive genius Jaylen Brown will be ready so I anticipate the Celtics will be easily able to handle the Bucks in this first round. However, Giannis Antetokounmpo is not to be underestimated at his 6’11” stature and freakish scoring prowess. Back up forward/center Aron Baynes will have his work cut out for him to keep the Greek Freak under wraps. The mighty Warriors have been held to second place all season long by the Houston Rockets, and with the season ending injury of Kawhi Leonard, the Spurs have slowly slid down in the Western Conference standings ending at 7th place. The departure of Tim Duncan has sent the Spurs into obscurity among the powerful Western Conference teams, and even with Leonard they are a far cry from the team they used to be. The certainty of Leonard’s future in San Antonio is still up in the air, and it’s rumored that he and the Spurs organization are at odds, but for the forseeable future, the Spurs are in a rebuilding position as a team. The 76ers have had one incredible season with a roster of top draft picks finally healthy and ready to play. All-Star Joel Embiid has panned out quite nicely for Philly, and if they can keep him healthy through the playoffs they will prove a formidable opponent for the highest ranking teams. The 76ers are the 3rd ranked defensive team in the league with the highest rebound percentage overall, and they’re ranked in the top ten for true shooting percentage along with being ranked 3rd in offensive rebounding. Embiid’s out-of-this-world talent combined with the budding skills of Ben Simmons at 15.8 points, 8.2 assists, and 8.1 rebounds per game have shown to be a tough match to beat, and facing the Heat in round 1 should prove no different. Miami’s Goran Dragic, and Hassan Whiteside make up the core of the team with a combined 31.3 points per game, but the Heat also has the incredible championship mind of Dwyane Wade back on the team as he makes his way toward retirement. Philly doesn’t have the playoff experience to take the Eastern Conference Finals this season, but I expect them to make their way through the first couple of rounds without too much trouble. The New Orleans Pelicans performed much better than I anticipated they would this season given the duo of ball movement stoppers they have on their roster in Anthony Davis, and DeMarcus Cousins. However, the with addition of the offensive coaching genius that is Chris Finch, they’ve managed to move up 4 slots in the Western Conference Standings this season and they’ll head to face the Trail Blazers in this first round of the playoffs. Portland inched out the Denver Nuggets last year for the 8th seed in the West, and this year they’ve gelled as a team and managed to wrangle the volatile emotions of center Jusuf Nurkic to be an effective, and much needed defensive presence under the rim. Nurkic has slimmed down for his new role in Portland, and is averaging 14.3 point and 9 rebounds per game to compliment the combined average of 48.3 points per game. The trouble for New Orleans is that Cousins is out for the remainder of the season with a ruptured Achilles’ tendon so they’ll have to rely on Davis and the gang to get the job done. Without Cousins, I expect the Pels to succumb to the Trail Blazers offense that is currently healthy, and running like a well-oiled machine. Cleveland made headlines back in February when they traded away a total of 6 of their players in a shocking team overhaul that left many of their recently acquired stars playing for other teams, and a new lineup ready to facilitate LeBron James‘ legacy once again. Since then, the Cavs have struggled to get their footing slipping to 4th place in the Eastern Conference standings. The Pacers on the other hand have remained fairly steady all year long, and while they’re consistently mediocre, they are consistent. Victor Oladipo, Damontas Sabonis, and Bojan Bogdonavic make up the Pacers’ core and they combine for a respectable 49 points per game. The problem for the Pacers is they’re simply too middle-of-the-road to excel in any one particular area of the game. They don’t rank in the top ten in any of the NBA’s advanced stats categories making them a tough bet in the post-season. Even though the Cavaliers are a bit of different team than they were to start the season, they still have James running the show, and as long as he is healthy and playing his game he’ll be a serious contender. With the usual core of James, J.R. Smith, Tristan Thompson, and Kevin Love, the Cavs will be tough to beat, and they’ll be able send Indiana into the offseason without breaking much of a sweat. Perhaps the most interesting playoff series (to me) in the first round this season will be between the Thunder and the Jazz. 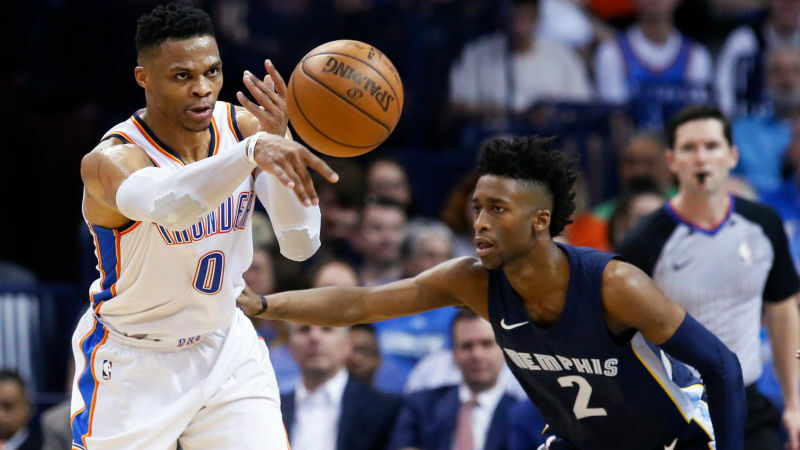 The Thunder have not performed as well as many thought this season with the acquisition of Carmelo Anthony and Paul George, but as things have come to an end they have kicked it into high gear and advanced a few slots in the Western Conference standings. Jazz Rookie of the Year candidate Donovan Mitchell has arrived on scene in All-Star fashion bringing in 20.5 points, 3.7 assists and 3.7 rebounds per game on top of winning the NBA Slam Dunk contest during All-Star Weekend 2018. However, Mitchell may have a tough time getting in his points against veteran All-Stars Westbrook, George, and Anthony with a little help of aggressive big-man Steven Adams. Utah’s strength mainly comes in their veteran depth with Rudy Gobert, Ricky Rubio, Joe Ingles and Derrick Favors ready to take on one of the West’s super-lineups. I’m not as certain about this prediction as I am about others, and I can’t wait to see what this series brings. Mention me @AshleyNBAHoops and let me know what your predictions are!